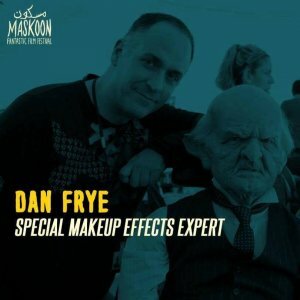 Dan Frye will be a guest at the Maskoon Fantastic Film Festival where he will hold an SFX Masterclass. Special make up effects and prosthetics master Dan Frye will reveal all his secrets in a live on stage demonstration of his special effects wizardry, taking the audience thorough the step by step process of turning one lucky volunteer into an Alien Soldier. Dan Frye has over 32 years of experience in New York, Los Angeles and London. He started his make-up career at 14 in New York City, working in local theatres. He worked as key make-up artist on such films as Frankenhooker, Brain Damageand Basketcase 2. Focusing on lab work and prosthetics, he moved to LA to work on films like Terminator 2, Leprechaun, Ghostbusters 2, Last Action Hero and Nightmare on Elm Street 5. A highly skilled mold-maker, painter, sculptor and prosthetic make-up artist, he moved to London to work on films including Shaun of the Dead, Resident Evil, The Cottage, Nanny McPhee, Charlie and the Chocolate Factory, Troy, Alexander, Clash of the Titans and Harry Potter and the Deathly Hallows Parts 1 & 2. More recent screen credits include Ridley Scott's Prometheus, Tim Burton's Dark Shadows, Mandela: Long Walk to Freedom, Dracula Untold, Victor Frankenstein, DoctorWho, Game of Thrones and Atlantis. In addition to working on set and in effect workshops, Dan teaches at Neill Gorton Prosthetic Studio as well as Titanic Creative Management (Belfast).